For the reception too, Juhi picked an Anita Dongre suit to wear. Chunky sandals and jewelry from Jaipur Jewels rounded out her look. The look didn’t do much for Ms. Chawla. Between the heavily pooling churidaar and those sandals, the look seemed heavy and weighed down. And the choice of jewelry didn’t help either. This was bit of a miss. 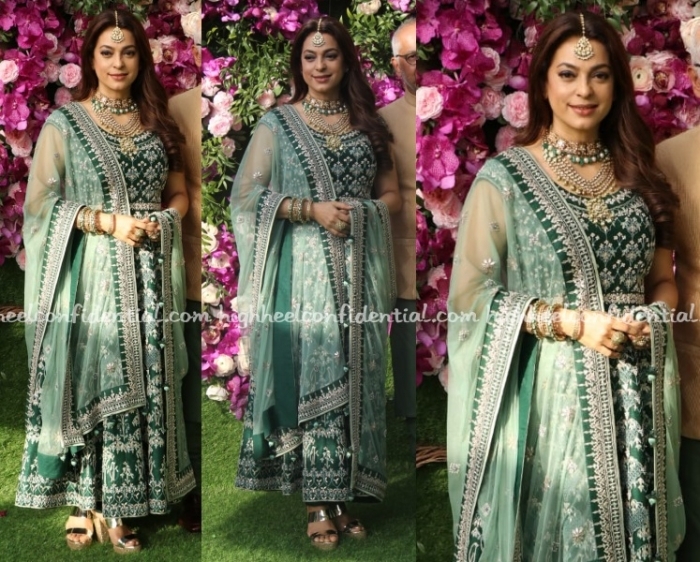 Wearing a green Anita Dongre anarkali, Juhi attended the Mehta-Ambani wedding. With the anarkali featuring all over work, one would think adding all that jewellery would make it worse, but somehow it all worked. She looked lovely. Juhi changed things up in her red separates while at a recent event. Pair of black sandals and a silver necklace were among her accessories of choice. The look made for a refreshing change of pace. The hair seems heavy for the look and wish she had either worn it up, or if down, then in softer waves. Also had she worn a necklace closer to the neckline or skipped it all together in lieu of a cuff or stack of silver bangles, the look would’ve been so much more effective. But hey, baby steps! Movie promotions had Juhi reaching for floor-grazing anarkalis, traditional jewelry and chunky metallic sandals recently. Neither of these scored a ten; here’s hoping going forward Juhi changes it up with her Indian-wear options! P.S: The pink suit is by Bhumika Grover.